A stingy guy is easy to spot when you know what to look for. There are various signs that qualifies them as a stingy person. A lot of stingy guys now leave their women to take up major responsibility if not every responsibility especially if she earns more. For women who experience this, it was never envisaged even though the signs were there all along but was ignored. In recent times, the number of empowered women has increased due to the rise in awareness, improvement of gender equality, education of the girl child e.t.c. It has now become common for women to play major roles in the home. Here are 12 shocking signs to spot a stingy guy. Be conservative about guys who are bent on knowing how much you earn, how much you are worth, financial capacity of your family and future financial prospects. There is absolutely nothing wrong with this but when it becomes a reoccurring routine question then you should watch your back. A stingy guy takes you out on a date and gives excuses why he can’t pick up the tabs. Says he forgot his wallet or how or ATM card and also does not make an effort to make decent transport available to you before or after the date. He will encourage you to buy gifts for his family members, take the credits and would not do same when it comes to your own family. A man with big dreams but little or no action to fund his dreams is likely to be a stingy guy. Run far away from any guy who is financially capable of taking care of his family but does not. There is no excuse in the world to justify this. He doesn’t buy you gifts on birthdays, valentine, anniversary, e.t.c. He always has an excuse for not buying and keeps promising to buy for the next occasion. If the woman happens to be the breadwinner of her family, he employs tactics to cut off every of her family member who has access to her resources. If the conversation comes up about money and he tells you constantly that he is broke. A generous guy is always sensitive to know when his lady needs money. He won’t consider the fact that the lady earns but will still provide financial assistance when necessary. Watch out for guys who are advocates for having joint accounts but will still keep private accounts. 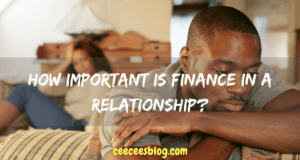 When he constantly talks about spending money: If he makes a lot of money related statement of how he spends and you do not see what he spends the money on.